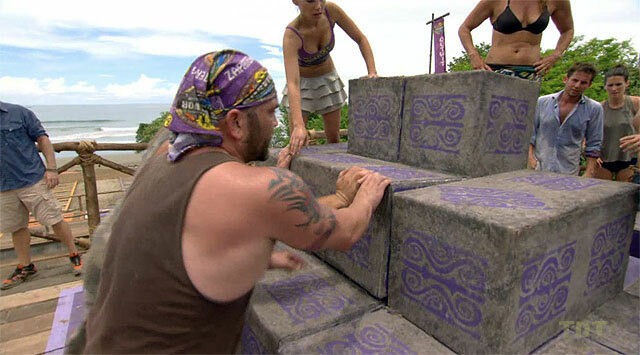 Received 2 jury votes to finish 2nd (7-2-0) in Episode 14, "This Game Ain't Over" (Day 39). Survivor: Heroes vs. Villains (2010) - 3rd place, zero jury votes. Received zero jury votes, to finish third (6-3-0) in Episode 14, "Anything Could Happen" (Day 39). Survivor: Redemption Island (2011) - 17th place, 2nd out. Voted out in Episode 3, "Keep Hope Alive" (Day 8). Eliminated in a duel (by Matt Elrod) in Episode 4, "Don't You Work for Me?" (Day 10). Cumulative totals: In-game - 8 days; Redemption Island - 2 days. SurvivorAU: Champions v. Contenders (2018) - 23rd place, 2nd out. Voted out in Episode 2 (Day 5). Samoa Ep. 1 RC: "Chief's Choice" - Russell carries logs, Foa Foa wins (mostly thanks to Jaison). Samoa Ep. 1 IC: "Yank Your Hank" - Hauls stuff, but Foa Foa loses. Samoa Ep. 2 RC/IC: "Schmergen Brawl" - Scores no points, Foa Foa loses. Then loses Borassi. Samoa Ep. 3 RC/IC: "Sea Crates" - Sits out as Foa Foa loses yet again. Samoa Ep. 4 RC: "Bocce In a Box" - Participates, and Foa Foa finds a way to lose without the presence of Probst. Samoa Ep. 4 IC: "Well Stacked" - Somehow, Foa Foa wins. Samoa Ep. 5 RC: "Samoa Smoothies" - Ashley can't drink her gross smoothie, Foa Foa loses again. Samoa Ep. 5 IC: "Sack Attack" - Russell holds up a lot of weight, but not enough. Foa Foa loses. Samoa Ep. 7 RC: "Brain Food" - Makes two matches, but Foa Foa loses again. Samoa Ep. 7 IC: "Canoe Dueling" - Thanks to the superior puzzle solving of Galu, Foa Foa loses again. Samoa Ep. 9 RC: "Coconut Code" - Not part of the winning team. Samoa Ep. 10 RC: "Get Hooked" - With Natalie, Dave, Brett, and Laura, finally part of the winning team. Samoa Ep. 13 RC: "Coco Plunk" - With Jaison and Shambo, part of the winning team. Samoa Ep. 8 IC: "Nut Cracker" - Scores four points, good enough for second for men (2nd/7). Samoa Ep. 9 IC: "Square Peg Round Hole" - Just misses advancing to the second round (4th/11). Samoa Ep. 10 IC: "Spear Me the Details" - Eliminated in the first round (tie-6th/10). Samoa Ep. 11 IC: "Drop a Log" - Second person to drop, circa 21 minutes, 1 knot left (8th/9). Samoa Ep. 12 F8 IC: "Fauxconut Bowling" - Loses to Shambo in the second round (3rd/8). Samoa Ep. 12 F7 IC: "Walk on Water" - Lands two bags (3rd/7). Samoa Ep. 13 IC: "Combo Platter" - Gets the six numbers, trying combos (tie-2nd/6). Samoa Ep. 14 F5 IC: "Tentacle" - Not that close to Brett (3rd/5). Samoa Ep. 14 F4 IC: "Over-Extended" - Eliminates Brett at 7 feet, and Russell wins! (1st/4). Heroes vs. Villains Ep.1 RC: "Battle Dig" - Scores a point as Coach drags Colby; Villains lose (3-2). Heroes vs. Villains Ep.1 IC: "Lock & Load, Light" - Rows for the Villains, putting them in a hole, but the Villains win. Heroes vs. Villains Ep.2 RC/IC: "A Crate Idea" - Rolls crates with Parvati & Coach; Villains win. Heroes vs. Villains Ep.3 RC/IC: "Sumo'an Mud" - Beaten by Tom, Villains lose big (8-0). Heroes vs. Villains Ep.4 RC: "Slip, Slide & Score" - Scores a point vs. Cirie, as the Villains win. Heroes vs. Villains Ep.4 IC: "Roll With It" - Blindfolded, works part of the table maze, and Villains win. Heroes vs. Villains Ep.5 RC: "Schmergen Brawl" - Scores no points, but Villains win again. Heroes vs. Villains Ep.5 IC: "Blind Cube Crisis" - Paired with Parvati, Villains win on the puzzle. Heroes vs. Villains Ep.7 RC: "Basket Brawl" - Scores no points as Colby and Candice dominate, Villains lose. Heroes vs. Villains Ep.7 IC: "Caught in the Web" - Sits out, Villains lose. 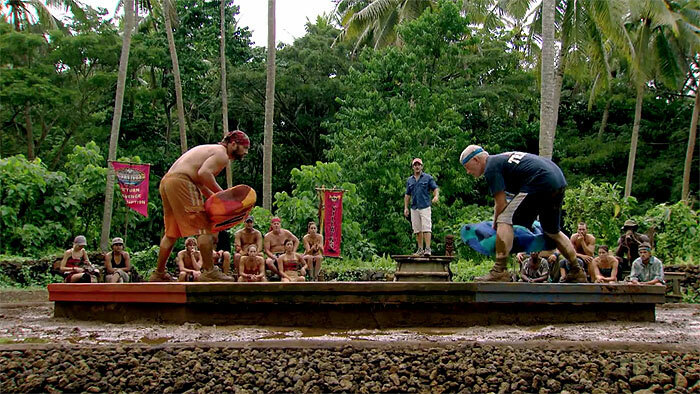 Heroes vs. Villains Ep.8 RC: "Faux Coconut Bowling" - Wins vs. Colby, but Villains lose. Heroes vs. Villains Ep.8 IC: "Mudslide" - Paired with Sandra, loses to Amanda/Candice; Villains lose. Heroes vs. Villains Ep.9 RC: "Chimney Sweep" - Sits out as the Villains finally win. Heroes vs. Villains Ep.9 IC: "Strung Out" - Thanks to Courtney's slowness, Villains lose. Heroes vs. Villains Ep.11 RC: "Pacific Shuffle" - Teamed with Sandra and Rupert, does not win. Heroes vs. Villains Ep. 6 IC: "Rope-A-Dope" - Finishes third among the Villains (3rd/9). Heroes vs. Villains Ep. 10 IC: "Get A Grip" - Third to drop out, shortly after Sandra (8th/10). Heroes vs. Villains Ep. 11 IC: "House of Cards" - Mere seconds behind Jerri (2nd/9). Heroes vs. Villains Ep. 12 Final 8 IC: "When It Rains" - Drops out 1 min. in (with Sandra) for cookies (7th/8). Heroes vs. Villains Ep. 12 Final 7 IC: "Pegatory Knockout" - Finishes, third, first, and first, and Russell wins (1st/7). Heroes vs. Villains Ep. 13 RC: "Pass the Bucket" - Teamed with Melanie, finishes just behind Jerri again (2nd/6). Heroes vs. Villains Ep. 13 IC: "Keep It Up" - Third to drop out (4th/6). Heroes vs. Villains Ep. 14 Final 5 IC: "Offer It Up" - Third person eliminated, at 16 dishes (3rd/5). Heroes vs. Villains Ep. 14 Final 4 IC: "Blind Maze" - Near 3-way tie for first with Parvati and Jerri, but wins (1st/4). Redemption Island Ep.1 RC/IC: "Push It Uphill" - Competes, and Zapatera wins. Redemption Island Ep.2 RC/IC: "Smash, Grab, Smash" - Retrieves a key, and again, Zapatera wins. Redemption Island Ep.3 RC/IC: "Spin Cycle" - David throws the challenge, Zapatera loses. Redemption Island, Ep. 4 duel: "Domino Effect" - Eliminated by Matt (2nd/2). AU: Champions v. Contenders Ep.1 RC: Not shown competing; both tribes win stuff. AU: Champions v. Contenders Ep.1 IC: Helps carry battering ram; Champions win. AU: Champions v. Contenders Ep.2 RC: "Sumo at Sea" - Beats Steve K. in final bout, Champions win, 7-3. AU: Champions v. Contenders Ep.2 IC: Performs no individual tasks, Champions lose. AU: Champions v. Contenders: None. Samoa, Ep. 2: Finds Foa Foa's idol in the middle of camp (Day 5). Samoa, Ep. 8: Plays his idol for himself at the merge Tribal Council, but received no votes against (Day 21). Samoa, Ep. 9: Hours after playing his last one incorrectly, finds another idol (Day 22). Samoa, Ep. 9: Plays his idol for himself, voiding 7 votes against, saving himself from the boot (Day 24). Samoa, Ep. 10: Hours after playing the last one, finds yet another idol (Day 25). Samoa, Ep. 1: Marisa Calihan (voted out, 7-3). Samoa, Ep. 2: Betsy Bolan (voted out, 7-1). Samoa, Ep. 3: Ben Browning (voted out, 6-1). Samoa, Ep. 5: Ashley Trainer (voted out, 5-1). Samoa, Ep. 7: Liz Kim (voted out, 4-1). Samoa, Ep. 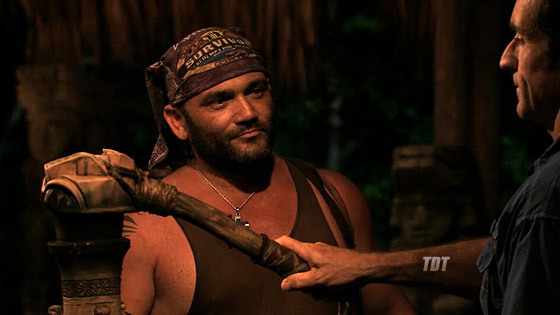 8: Erik Cardona (voted out, 10-2). Samoa, Ep. 9: Kelly Sharbaugh (idoled out, -4). Samoa, Ep. 10: Laura Morett (voted out, 5-5 [5-3 on re-vote]). Samoa, Ep. 11: John Fincher (voted out, 7-1-1). Samoa, Ep. 12 (F8 vote): Dave Ball (voted out, 7-1). Samoa, Ep. 12 (F7 vote): Monica Padilla (voted out, 5-2). Samoa, Ep. 13: Shambo Waters (voted out, 5-1). Samoa, Ep. 14 (F5 vote): Jaison Robinson (voted out, 4-1). Samoa, Ep. 14 (F4 vote): Brett Clouser (voted out, 3-1). RECORD: Russell's 14 VFB in Samoa is tied with Natalie White for the most people voted out in a single season. Samoa, Ep. 12 (F7 vote): Two votes, from Brett and Monica. Samoa, Ep. 14: Received two jury votes, from Shambo Waters and John Fincher, to finish second (7-2-0). Heroes vs. Villains, Ep. 4: Finds the Villains' idol while everyone else works on shelter (Day 9). Heroes vs. Villains, Ep. 6: Plays his idol for Parvati, voiding four votes, and saving her (Day 15, credit to Russell). Heroes vs. Villains, Ep. 9: Given the Heroes' idol by JT/Colby after the immunity challenge (Day 24). Heroes vs. Villains, Ep. 10: Gives his idol to Parvati before Tribal, where she plays it (Day 27). Heroes vs. Villains, Ep. 11: After hearing Danielle's clue, finds another idol (Day 28). Heroes vs. Villains, Ep. 11: Plays his idol at Tribal, although he received no votes (Day 30). Heroes vs. Villains, Ep. 6: Tyson Apostol (idoled out, -3-2). Heroes vs. Villains, Ep. 7: Boston Rob Mariano (voted out, 4-3-1). Heroes vs. Villains, Ep. 10: J.T. Thomas (idoled out, -5). Heroes vs. Villains, Ep. 12 (F7 vote): Danielle DiLorenzo (voted out, 4-3). Heroes vs. Villains, Ep. 6: Two votes, from Sandra and Rob. Heroes vs. Villains, Ep. 7: Three votes, from Sandra, Courtney, and Rob. Heroes vs. Villains, Ep. 14: Received zero jury votes, to finish third (6-3-0). Redemption Island, Ep. 3: Three votes, from Mike, Steve, and Ralph (voted out, 3-3-3 [5-1-0 on re-vote]). AU: Champions v. Contenders, Ep. 1: Finds Champions' hidden idol (Day 2 as shown, although he claims Day 1). AU: Champions v. Contenders, Ep. 2: Voted out while wearing his idol at Tribal Council (Day 5). AU: Champions v. Contenders, Ep. 2: Four votes, from Moana, Samuel, Shane, and Sharn (voted out, 4-4-2-2 [9-1 on revote]). Hey, Foa Foa actually won something! Which direction is it, guys? Thanks for saving me, JT! And done. 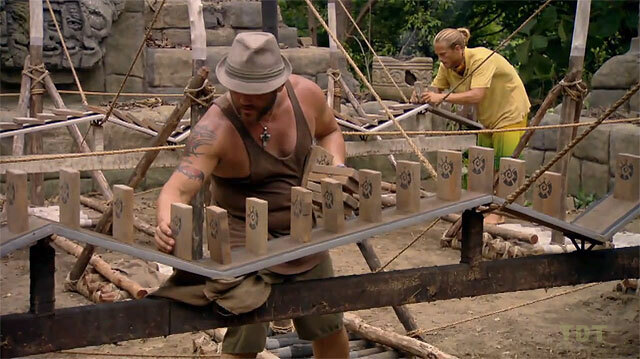 Post-duel chat with Probst. About to score the winning point vs. Steve K.
Andy Dehnart at Reality Blurred (9/16/09): "Russell Hantz: 'I control every aspect of my life... my family,... my job,... even my friends'"
Gordon Holmes at XfinityTV.com (12/22/09): "Runner-Up Interview: Russell Hantz"
Dalton Ross at Ew.com (12/21/09): "Russell says 'I wanted to cry' at the reunion"
Gordon Holmes at XfinityTV.com (5/20/10): "Runner-Up Interview: Russell Hantz"
Daniel Fienberg at HitFix.com (5/20/10): "Russell Hantz talks Survivor: Heroes vs. Villains"
Dalton Ross at EW.com (2/15/11): "Boston Rob warns Russell: 'Don't burn any of my s---!'" 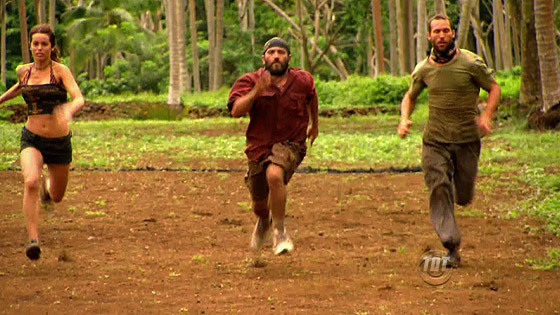 Dalton Ross at EW.com (3/10/11): "Russell threatens to sue tribemates and calls Boston Rob a 'Survivor whore'"
Gordon Holmes at XfinityTV.com (3/10/11): "Castaway Interview: Russell Hantz"
Daniel Fienberg at HitFix.com (3/12/11): "Russell Hantz talks Survivor: Redemption Island"
Rob Cesternino at RHAP (1/28/12): "The Greatest Russell Hantz Interview of All Time"
"Russell Hantz’s personality speaks for itself when he proudly displays a missing tooth that he refuses to fix! This married father of four is visually memorable. Standing tall at only 5’6”, he is built like a brick house with a bald head. At 200 pounds of pure muscle, Russell’s solid figure and sharp tongue has helped him carve out a multi-million dollar business in the oil-tanking industry. Russell can’t wait to get in the competition and show “these morons how it’s done” and he “plans to play the game dirtier, smarter and more cunning than anyone can imagine.” It is those skills that have allowed him to achieve his biggest accomplishment in life and that is being able to provide for his family. Russell is married with four children and currently resides in Dayton, Texas. His birth date is October 10th. " Why Did He Come Back? : “Because I have to put these kids in their place. 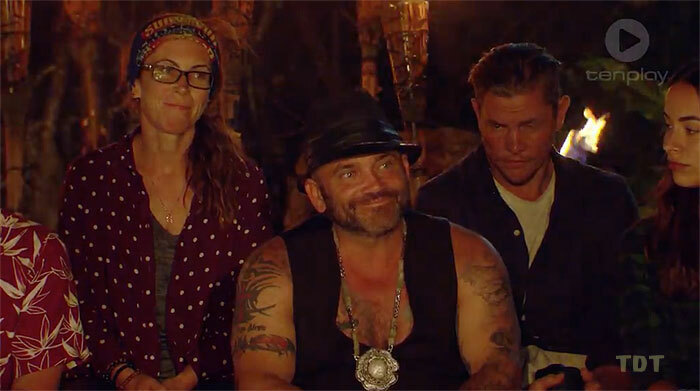 I’m not done playing just yet!”"
"Russell Hantz was a first time castaway only 2 years ago, but has quickly become one of the most notorious villains to every play Survivor. He returns to Survivor: Redemption Island more prepared than ever before. "I'm ready for this. I'm more ready for this than I ever have been." 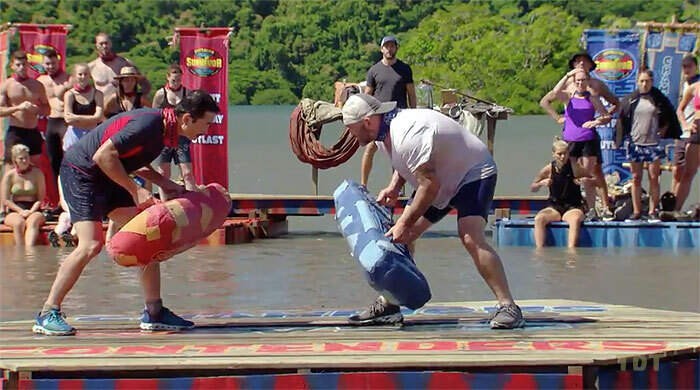 As a self-made millionaire who built his business by working hard, speaking his mind and stepping on anyone who got in his way, Russell will do anything to win the game of Survivor. He is known for back-stabbing his allies, lying and cheating, but he is proud of his title as a villain. "The image that I have as a villain, that’s fine with me because this is how I play the game." Only time will tell if this strategy will pay off or if once again he will come up short. What does he think of Survivor: Redemption Island? 'It's gonna be history. Survivor history!'" "Regarded by super fans everywhere as Survivor’s greatest villain, Russell is one of the most notorious characters in the US show’s history. Considered to be one of the most influential contestants of all time, Russell is ready to take a crack at his Aussie counterparts, making it the fourth time he has played the game. Famous for his stints on Survivor Samoa, Heroes vs Villains and Redemption Island, Russell has made it to the end but never won the title of sole survivor. Russell is one of only five contestants to be inducted into the Survivor Hall of Fame in 2010 and he is also one of the only competitors to ever make it to the finals in more than one season. Lying, stealing, sabotaging his fellow tribe members, there’s nothing Russell won’t do to win. Father of four and recently a grandfather, he won’t let anything get in his way saying, “When I’m out there, I am a blank screen. My family don’t matter until I get off that island. I’ll be playing for them but I won’t let my emotions get in the way and I won’t let it make me soft. “I’m very excited to take on the Australians, they won’t know what’s hit them when they see me walking out on day one.”"